Our offer of apparel includes unisex and ladies T-shirts, sweatshirts and baseball caps. 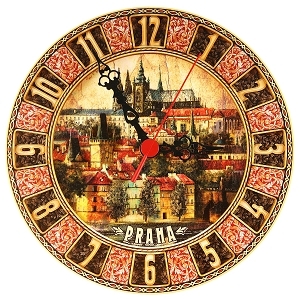 All these products are printed or embroidered with original graphics of Prague and Czech Republic sights and attractions. Motive Prague Czech me Out!, I love PRG, Praha Drinking Team. We offer two kinds of souvenirs: things that are nice and things that are useful. 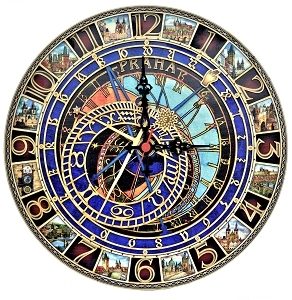 Wooden clocks represent the useful ones while fridge magnets and ceramic models of buildings will preserve the memory of your trip to Prague. We cover all major Prague sights - Prague Old Town Hall, Charles Bridge Tower, Prague Castle, Prague St. Vitus Cathedral, Prague Old Synagoga, Prague Bell House, Prague St. Nicolaus Church, Prague Tyn Church, Prague Astronomical Clock. All our products are designed and made locally in Czechia. Our Conference & Tour Service provides bulk deliveries of gift wrapped conference giveaways or presents for groups of tourists directly to hotels and conference premises in Prague and other cities in Czechia. We can deliver hundreds or even thousands of pieces of most of our products in 1-2 weeks after order. We are committed to deliver high quality authentic local products and souvenirs. We carefully select local vendors who design and produce their products in Czechia and avoid imported stuff with little originality and low fidelity. We concentrate on products with clear connection to Prague and Czech Republic sights, history, culture and religion. Our store uses dedicated SSL certificate and strong encryption to protect your personal data. Pursuant to Payment Registration Law the seller is obliged to provide the customer a receipt which will be included on invoice and sent with the ordered goods. Also he is obliged to online register the received payment with tax authority, in the case of technical outage within 48 hours.